Minister of Local Government and Rural Development Kazim Hosein, left, clings to a dump truck as it crosses the water in Mayaro yesterday. Despite a lessening of rainfall and favourable low tides which allowed flood waters to flow into the Atlantic Ocean, parts of Mayaro remained under flood waters yesterday. The areas include Mafeking Village (which is accessible by truck only) and Cedar Grove which remains cut off from the rest of Mayaro and is only accessible by boat. 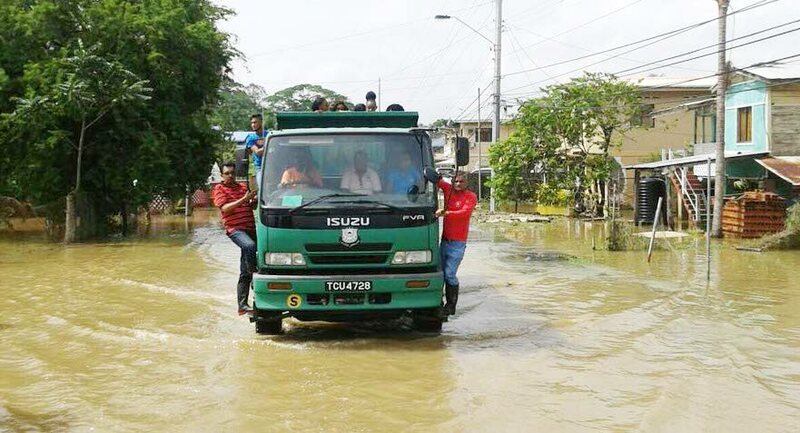 Rural Development and Local Government Minister Haji Kazim Hosein, who toured the affected area with Mayaro MP Rushton Paray and members of the Mayaro/Rio Claro Regional Corporation (MRCRC), attributed the flooding to the heavy rainfall which caused the Ortoire River to overflow its banks. “People were really affected but with the low tide, the water started to recede very fast from this morning (New Year’s Day) to around 3 pm, the water was going down,” Hosein said. “There wasn’t any panic but people were affected,” he said, adding there was between three to five feet of water in some places. He said mopping up operations were expected to begin today as the flood waters continued to recede saying CEPEP workers were expected to join their counterparts in the regional corporation. Meanwhile, MRCRC chairman Glen Ram said corporation trucks were being used to transport people out of the affected communities including the Logwood area. Ram said the corporation also activated the Mayaro Civic Centre as an emergency centre for use by people who had been affected by the floods. Ram, however, lamented that the corporation had not been given any financial resources since last September and had to depend on donations from the Mayaro business community for basic flood relief supplies. In an advisory, the ministry noted that the following roads remained impassable to low vehicles: Sakeer Trace; Plum Mitan Road, Biche; Mafeking Village (Trucks only); Cedar Grove; and Couva Exchange Road to Waterloo. A meeting is scheduled to take place at the Ministry of Local Government head offices in Port of Spain tomorrow at which all corporation chairmen and mayors have been invited. Reply to "Parts of Mayaro still impassable"